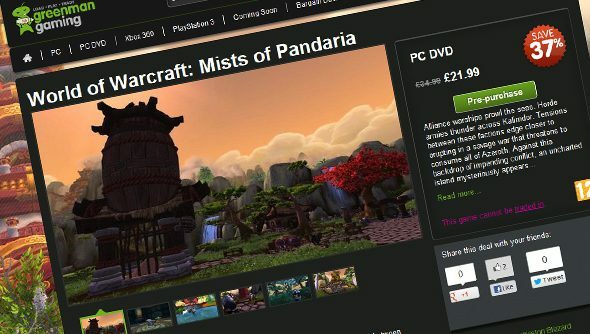 Green Man Gaming’s mad discounting of upcoming MMOs continues with their current sale: they’re offering 37% off Mists of Pandaria [update: exclusively to UK customers], which cuts the price of the Panda-centric World of Warcraft expansion to a paltry £21.99. That’s about the price of two cinema tickets in central London, a meaningless and arbitrary comparison I have just made. Last week, the retailer slashed the price of Guild Wars 2 for a day, undercutting most other vendors as well as the price offered on ArenaNet’s own site. This is a similar daily deal, ending on Tuesday at 11:00 UTC, so if you’ve been indecisive about pandas in the past, now’s your chance to take control of your life by pre-ordering a discounted videogame. Mists of Pandaria is unlikely to get any cheaper before launch.